Buffalo State College has played a leading role in the growth of Western New York since its founding in 1871—and today, the college’s impact on the community is stronger than ever. 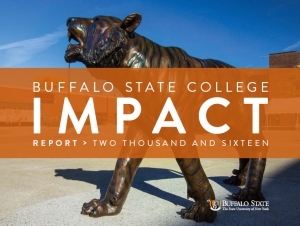 Details on the many ways the institution contributes to the quality of life in Western New York are contained in the newly released 2016 Buffalo State College Impact Report. Buffalo State delivers $680 million in total economic impact annually. Buffalo State managed $350 million in new construction and renovations on campus between 2009 and 2016. Buffalo State creates 7,829 jobs annually (direct, indirect, induced). Buffalo State earned the highly prestigious Carnegie Foundation Community Engagement Classification for its commitment to community service, with more than 480,000 community service activity hours volunteered annually. Buffalo State boasts an alumni base that is 107,065 strong and includes some of the area’s leading public officials, businesspeople, and educators. To request a printed copy of the report, please contact Kristin Van Slyke, development associate, at (716) 878-4658.